A large crow stands in profile on a rock in the foregorund. Just behind it is another crow, its right foot caught in the jaws of a metal trap, in front of which appears the head of a dead rabbit. A third crow hovers above the scene. 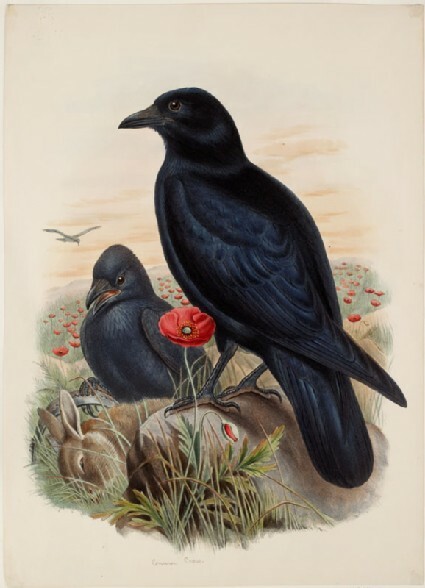 This print was taken from John Gould's "The Birds of Great Britain", published in five volumes from1863 to 1873. Ruskin's name appears in the list of subscribers. The "Carrion-Crow", which Ruskin mis-transcribed as "Common Crow" in the inscription, is pl. 58 of vol. III and is entitled "Corvus corone, Linn." In the accompanying text Gould writes: 'The figures are rather under the natural size. The flower is the common red poppy ("Papaver Rhæas, Linn.")'. In the same text he comments on the unusual narrative depicted in the picture: 'For the sake of showing this mode of capture I have in this instance gone a little out of my way, and represented in the accompanying Plate a bird in a difficulty from which he could never extricate himself. Sympathy he may obtain from his partner, to whom he has probably been united from the attainment of maturity; but assistance she cannot render him. If the Crow can be tempted to put his toes on the trap his doom is sealed, as it also is when he partakes of the strychnined piece of flesh which the keeper purposely lays for him'. According to James Dearden (personal communication, 20 December 2003), Ruskin's copy of Gould's "British Birds" was sold by Sotheby’s, 18 May 1931, lot 79, to Marks for 6 guineas, and are now untraced. He suggests that the set which Cook and Wedderburn describe as having been given away (XXXIV.699) may be the set now in the collection of the Guild of Saint George; these are complete, so cannot be the source for the plates in the collection. Ruskin listed a series of plates from Gould in all of his published Rudimentary Series catalogues (1872-3), occupying the second section of cabinet eight, that is, nos 189-200, of which this is one. Nos 181-187 had been replaced by drawings by Stacey Marks by the time of Cook and Wedderburn's edition of the catalogues in 1906. Gould's plate of the "Little Egret" was also included in the series as no. 225. Ruskin did not produce individual catalogue entries for the plates of birds in this section of cabinet eight (as well as the Le Vaillants and one other Gould in cabinet nine). Instead, the contents of the cabinet are simply referred to as plates from Gould. The reason this might be so is hinted at in an inscription, presumably in Ruskin's hand, on Rudimentary Series no. 223, which reads: 'All these plates are only put in temporarily: and un-named; because every bird has half a dozen names, now, and I can't get my catalogue printed, safely, yet, but for drawing practice - they will serve, just now. It is of no use arranging till the frames are all filled'. Although Ruskin claimed that 'entire dependence may be placed on the accuracy of representation', he observed that the 'fine lithograpic texture' of the plates might make copying difficult. However, he seems to have valued them for their potential to further his students' relationship with birds and their study (pp. 20-21 in all published Rudimentary Series catalogues) - as also appears in other references which he made to Gould's work (Fors Clavigera, letter 51 (March 1875), § 23 = XXVIII.290; Love's Meinie, § 87 = XXV.77-9; The Eagle's Nest, §§ 173-9 = XXII.241-4 - the latter emphasizing seeing and drawing birds as a means of understanding them). Ruskin noted in his catalogue that Gould's "Birds", like Le Vaillant's "Histoire naturelle des oiseaux de paradis" (1806), 'should eventually form a part of the student's library' (all published Rudimentary Series catalogues,l p. 20). However, as Cook and Wedderburn have concluded, such a library was never formed on account of the numerous facilities available in Oxford, although a few books were set aside in a case at the Drawing School (XXI.226 n. 6). Recto, bottom centre, in graphite: Common Crow. These are not here catalogued, because I propose that Mr. Gould’s book should eventually form a part of the student’s library, and the frames will then be occupied by drawings. The fine lithographic texture of these prints is not adapted for copying, but entire dependence may be placed on the accuracy of representation; and I believe even these few examples will be greatly useful in exciting the interest of the younger students in ornithology, and especially in the living birds.